The TEXT Program, or “Tibetans in Exile Today,” is an oral-history project designed to record the stories of Tibetans currently living in refugee settlements in India. The program focuses on the Tibetans who left their country in 1959, but still have vivid memories of traditional Tibetan culture. Tibetans Respond to Our Question: What Are Your Hopes for Tibet’s Future? 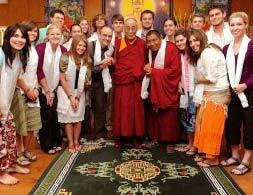 University of Arkansas students with His Holiness the Dalai Lama on their trip to India in 2009.